Justice Catherine Bamugemereire (second right) and other land commission members during a past probe. File photo. KAMPALA. Businessman Ephraim Ntaganda yesterday (Wednesday) appeared before the Justice Catherine Bamugemereire-led Land Commission to defend himself over allegations of fraudulent land acquisition. It is alleged that Ntaganda through his Prestigious Apartments Limited connived with some officials in the Education ministry, Uganda Land Commission (ULC) and Kampala Capital city Authority (KCCA) to obtain a lease for two hectares of land belonging to Nakasero Primary School without the consent of the school management. Evidence presented before the commission indicates that ULC parceled out the land on Plot 34A and created plots 34A1 and 5C on Kyaddondo and Macknon Roads respectively. Appearing before the commission, Ntaganda confessed that he knew Nakasero Primary School was using the land but he went to city authority because it is the controlling authority. Mr Ntaganda is accused of conspiring with a one Night Alice, the City education officer at Central Division, to deprive Ugandans and their children of a recreation facility. Mr Ntaganda was questioned in regard to the numerous correspondences by former education commissioner Mr John Agaba and ULC that gave a no objection to his company to acquire the disputed land. Asked for a copy lodged to acquire the land, Mr Ntaganda who did not have a copy, also admitted going to the school administration after acquiring the land title and proposing to re-roof the school and a public private partnership. “I apologize to this commission that when I was leaving the importation business, I thought of a better business but I have since realized that it was a wrong business and I used a wrong model,” he said. Ntaganda who is accused of intending to steal the school property by way of proposing the re-roofing of the school during the school holidays testified that he applied for the land in order to sell it at higher price but denied interfering with the processes. He confessed that him and his partner Bob Kanabi sold their shares to Muhamood and Shaidah Baruani because they did not have the money to pay for the premium of Shs120 million and Shs6 million for ground rent. He said the land title was issued after selling his shares but remained as a director to help the company acquire the land title. “We did not directly sell the land, we only sold the company because it was the condition of the people who were taking over shareholding that if they were to pay ground rent, they had to see us out as shareholders,” said Mr Ntaganda, revealing that the land was mortgaged at Shs3 billion and another $2 million was secured. The Commission observed that since 2012, inquiries by the Inspectorate of Government have stalled because the file comprising of documents regarding Prestigious Apartments Limited on the disputed land has since disappeared from ULC. Mr Ntaganda revealed that Plot 34A1 was sold at $400,000 yet the entire land under dispute was acquired at Shs120 million. 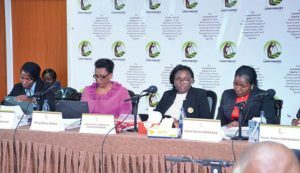 The Catherine Bamugemereire land commission was appointed on December 8, 2016 and started operation on February 19. Its first mandate expired by November 9, 2017 but it was extended. The seven-member commission’s mandate is to inquire into the effectiveness of law, policies and processes of land acquisition, land administration, land management and land registration in Uganda.